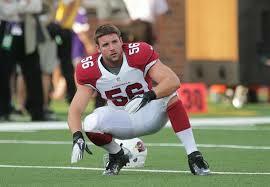 Linebacker Glenn Carson made the Arizona Cardinals’ regular-season roster. Carson, a graduate of Southern Regional and Penn State, was not listed among the players released when the Cardinals announced their roster moves to get down to 53 players. Carson signed with Arizona as an undrafted rookie free agent. He helped his bid to make the team on Thursday night, when he registered a team-high 10 tackles for the Cardinals in their preseason finale against San Diego. He finished the preseason with 17 tackles. Carson was the Asbury Park Press Defensive Player of the Year in 2008, when he led Southern to a 10-2 season and a trip to the NJSIAA South Group IV championship game. The Rams set a school-record for wins that season and it was their first trip to a sectional final. Carson was also an NJSIAA state champion 215-pound wrestler in 2009, his senior year, and a three-time state 215-pound finalist.